Within 100 meters walking distance, is the harbor and the departure point of the ferries to Chryssi Island, two organized beaches with the Blue Flag and the Old Town. Furthermore, bus station KTEL is 300 meters walking distance from Coral Boutique Hotel, the airport ‘’Nikos Kazantzakis’’ in Heraklion is 96km and the airport of Sitia is 60km away. The city of Agios Nikolaos is 36km distance. Coral Boutique Hotel has 14 rooms and a penthouse house of 2 bedrooms. The rooms are elegantly furnished and feature a window, balcony or large terraces overlooking the Libyan Sea and the city center. 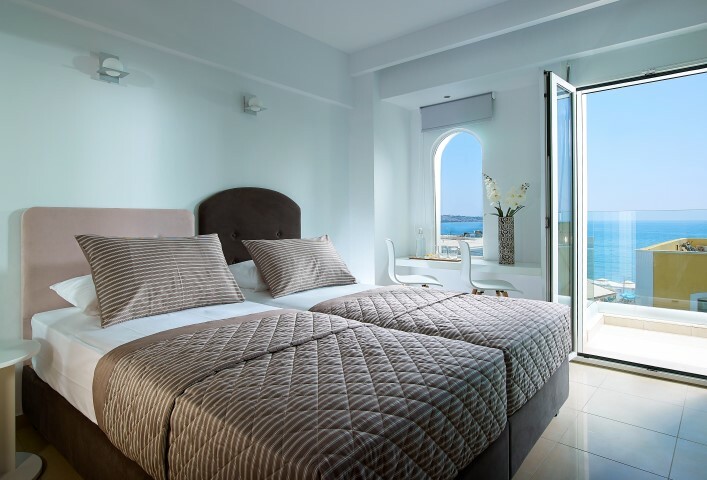 Offering view of the Libyan Sea and the center of Ierapetra, the rooms are designed to ensure your comfort. Fully renewed with modern furnishings, beautiful decorative objects and smart lighting provide comfort, elegance, romantic and relaxing atmosphere, everything that an accommodation requires. Elegantly furnished 14 sq. to 48 sq. can accommodate 1 to 4 guests. Meet the stylish interiors with modern furnishings and comfort. Enjoy the unparalleled view of the Libyan Sea, the city and the amazing sunset on the southernmost tip of Europe.